Curious about wine – but find wineries to be pretentious? Santa Barbara, CA’s Funk Zone is for you! In our last post, the CD showed you three refined tasting rooms along Santa Barbara, California’s Urban Wine Trail. Today, we’ll switch gears and visit a few of the irreverent, well, funky tasting rooms and a brewery in the city’s four block Funk Zone, where wine is fun and the crowds much livelier than most of the wine trail’s low-key and polished tasting rooms. The Funk Zone feels a bit industrial, college-y, and more social. The energy runs much higher than the average winery (anywhere in the world). I think of it as Wine University. Go there and you’ll discover (or re-discover) the fun side of wine, from local, experimental varietals or blends to wines from other regions and countries, to little known traditional styles. The crowds are friendly, the hosts happy to share the joy of wine with patrons (or just as happy to leave patrons alone to enjoy the wine among their own friends if they don’t seem to care about wine education). First stop for us was a drop into Municipal Winemakers. The name is as atypical for a winery as is the ambience. Industrial and purposefully unfinished on the inside, the tasting room feels like it could be someone’s converted residential garage. 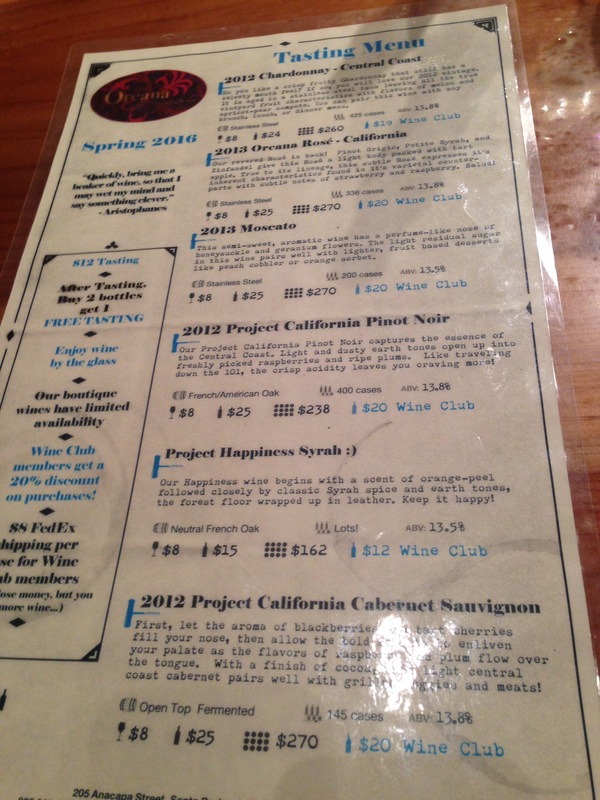 The wine list is an unpretentious board with moveable plastic letters. The top line reads, “Wine tasting costs $14 dollars, unless you’re awesome” (the “awesome” is a nod to their Club Awesome wine members). They make quite a few Grenache-based wines, including a Grenache blanc, and they also sell wines from Fox Family Winery to compliment the Municipal brand. Next, we made a longer visit to Cork and Crown, a cozy tasting room and wine shop that sells only other people’s wine and beer. 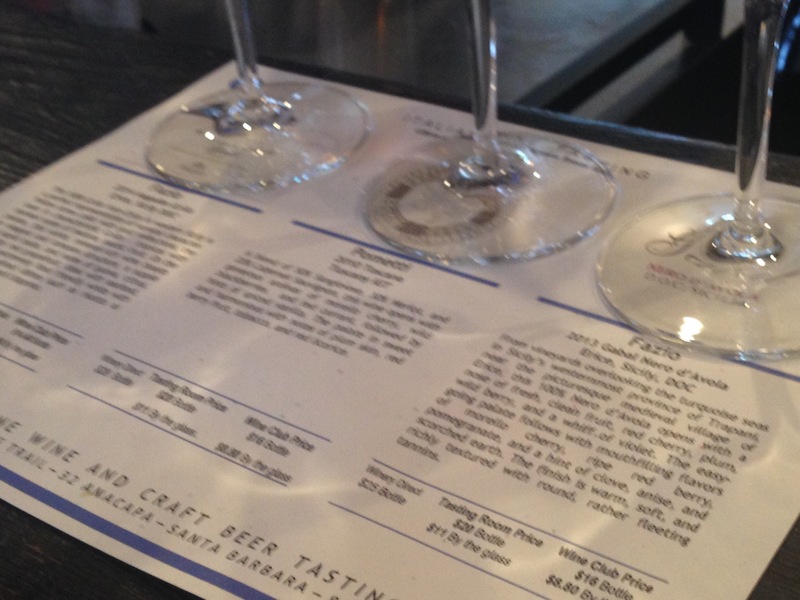 Featured wine and beer flights change monthly, each bearing a theme. My friend chose an Italian-themed flight to continue her streak after enjoying a Californian Super Tuscan blend. A Sicilian white and Tuscan and Sicilian reds completed the flight. Those selections were great representations of Italian wine. The Sicilian Nero D’Avola was my favorite of the three, with its bouncy, fruity character befitting of the popular tasting room’s bustling vibe. 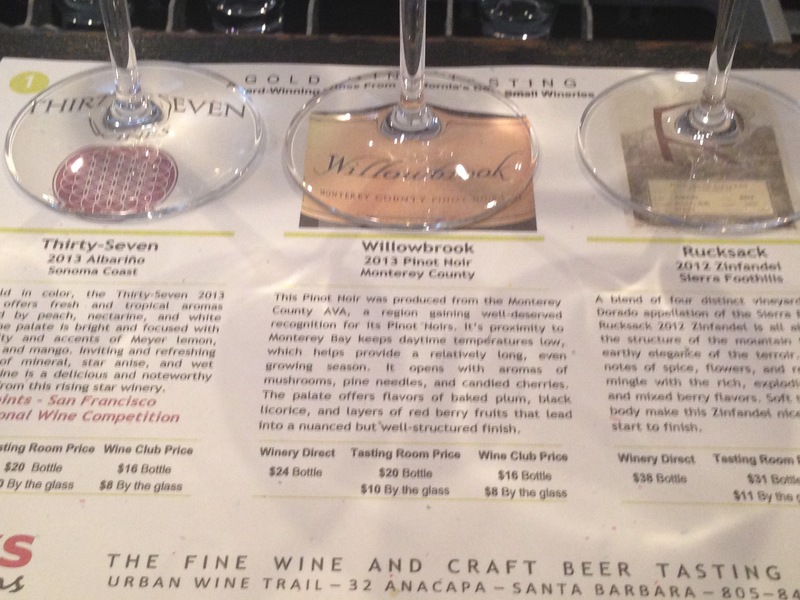 I sampled the Gold flight, which highlighted three award winning wines from across California. This particular flight included a rare, tart , and crisp Californian Albariño from the cool, foggy Sonoma Coast; a medium-bodied, fruity Pinot noir from Monterrey County, and an herbal, relatively lighter, less fruity Zinfandel from the Sierra Foothills AVA. All three wines were great picks and nicely contrasted with each other. After a dinner break, we made an unplanned visit to Oreana Winery, lured by live music from a guy with a guitar. Oreana, housed in a converted commercial auto body shop, was truly the quintessential first stop for new wine drinkers. Its long list of uncomplicated, light wines were varied enough to help someone discover wines without breaking the bank. It is a great place for a group social outing, to relax and unwind after a long day with its late evening hours. The unoaked Central Coast Chardonnay was my favorite. We thought Oreana would be our last stop in the Funk Zone, but once again, live music changed our minds. The amusing phenomenon that was a funk band playing in the funk zone seemed to ridiculous to refuse, so we hopped on over to Figueroa Mountain Brewery. The brewery serves a wide variety of enticing beers, some of which seemed a bit head scratching: did they brew both a blood orange wheat beer and Mandarina wit beer to settle a Brewers’ dispute? (“My American wheat is better than your German wheat?”). 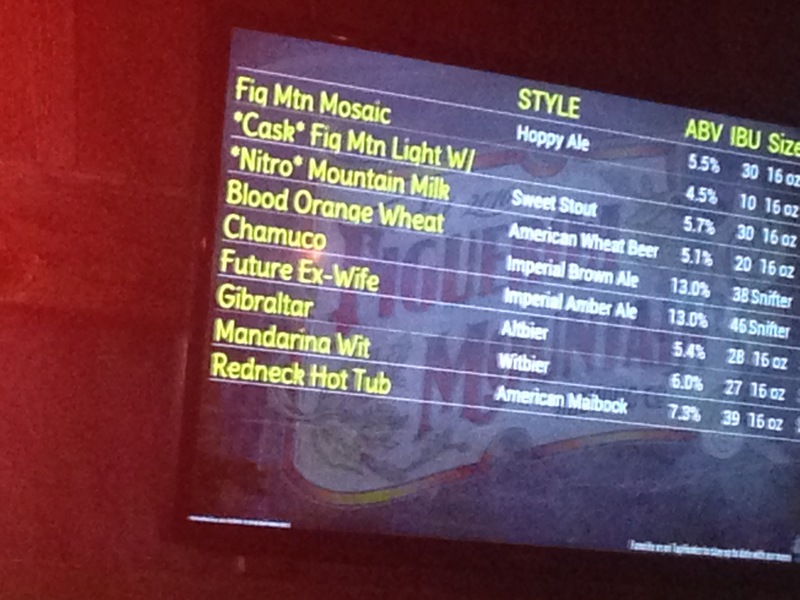 I was tempted to try the “Future Ex Wife” due to the name alone but was deterred by its potent 13% ABV. “Redneck Hot Tub” also sounded fun, but in the end, I chose the blood orange wheat, which was pretty much the perfect summer ale in my opinion. A pair of charming local gentlemen we met there told us that the brewery is a top draw in the funk zone. They also told us later that the Future Ex Wife was even better than expected. With the lively band, an all-ages crowd, and great beers, Figueroa is a great Saturday night hangout for locals and tourists alike. At the end of our Urban Wine Trail adventure, my friend and I reflected and marveled at how much we experienced during our short hike – from premier boutique wineries to unpretentious, fun wine and beer tasting rooms, from the local to the international. Santa Barbara’s Urban Wine Trail is an experience not to miss!